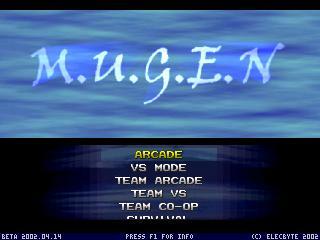 Mugen" is a word of Japanese origin, meaning dream, fantasy, or infinite... "M.U.G.E.N" is a freeware 2D fighting game engine designed by Elecbyte, released on July 17th, 1999. The program was written in C with the Allegro library. Beta versions were made for DOS, Linux and Windows, and was distributed through their website. "M.U.G.E.N" is actually an unknown acronym. The creators, Elecbyte, never told what it was. In fact, they admittedly stated that they forgot what it stood for.